Download "PREPARING YOUR WILL WHY HAVE A WILL. The first reason for having a Will is to provide an orderly administration of your estate that ensures"
1 PREPARING YOUR WILL WHY HAVE A WILL The first reason for having a Will is to provide an orderly administration of your estate that ensures that your assets are distributed amongst those that you wish to have them. The second reason is to ensure that your children under the age of majority are provided sufficient funds as and when they need them, to provide for their care, maintenance, upbringing and education. Without a Will your estate will be distributed in accordance with the rules set forth in Provincial Legislation. This may not be in accordance with your wishes. Also it may be necessary for someone to post a bond to become the Trustee of your estate. Further, you may find that your spouse has to share assets with your children even though they may still be in their minority. Finally in the event the children are beneficiaries and they are under the age of majority their share will be held by the Public Guardian And Trustee and administered by them until the child reaches the age of majority. WHAT YOU WILL TRANSFER BY YOUR WILL Upon your death only assets owned by you will be governed by the provisions contained in your Will. This may sound obvious however life insurance policies that you have designated to certain beneficiaries will go to those beneficiaries and will not be governed by your Will. Likewise any assets that you jointly hold with other parties are generally held with right of survivorship such that the survivor becomes the owner and the asset or the share of the asset does not go to your estate. Pensions or RRSP s may have designated beneficiaries and you need to refer to the particular plans that you have to determine their provisions. 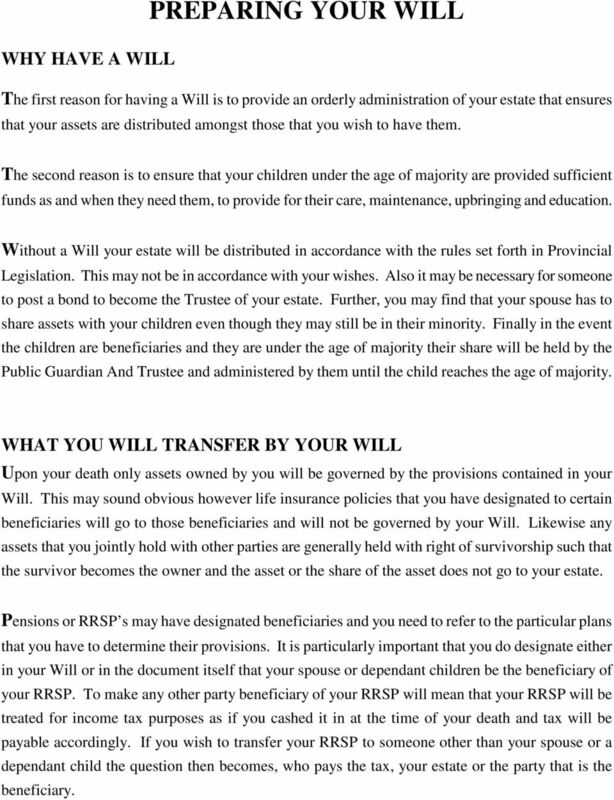 It is particularly important that you do designate either in your Will or in the document itself that your spouse or dependant children be the beneficiary of your RRSP. To make any other party beneficiary of your RRSP will mean that your RRSP will be treated for income tax purposes as if you cashed it in at the time of your death and tax will be payable accordingly. If you wish to transfer your RRSP to someone other than your spouse or a dependant child the question then becomes, who pays the tax, your estate or the party that is the beneficiary. 2 2 It is extremely important that you ensure at the time of doing your will that any beneficiary designations that you have made are consistent with your wishes and do not conflict in any way with your will. If it is your intention to revoke any beneficiary designations by your will then it is important that you specifically refer to the beneficiary designation and to the policy under which there is a beneficiary designation. If you have designated your infant children beneficiaries under a policy of insurance, it may be better, from an administrative point of view, to designate your estate as the beneficiary so that the provisions of your will will govern the use of any insurance proceeds. Partnership interests or shares held in private limited companies may be subject to agreements with your other partners or shareholders and those agreements should be reviewed. If there are no provisions for transfer in the event of death then that is something that you should review to ensure that in the event of your death your interest is either purchased by your partners if that is your wish or is transferable to your beneficiaries. LISTING DEBTS AND ASSETS Attached is a checklist to fill out and list your significant assets and debts. This is a record that should be kept up to date and kept with your valuable records so that in the event of your death your Estate Trustee knows where to begin. It is particularly important to keep track of any private loans or debts since you may be the only one keeping a record of this. While this really is a matter for an insurance salesperson it would be worth your while to consider whether you have sufficient assets or life insurance in place to provide for your debts, funeral and burial cost and provision for your dependants in the event of your death. YOUR SPOUSE Most couples leave everything to their surviving spouse however in some instances people wish to make specific provisions for their spouse and perhaps leave the income of the estate to the spouse with the capital to go to the children upon the death of the spouse. Further in the case of second marriages sometimes people wish to provide that their separate assets go to their children alone. In this instance it may also be useful or necessary to pay the income of the estate to the surviving spouse. 3 3 YOUR CHILDREN In the event that a spouse does not survive most people leave the remainder of their estate to their children. It is preferable from a lawyers drafting point of view if percentages of the estate are divided amongst the children rather than amounts, however if there are specific assets to go to any particular children those can be accommodated as well. It must be remembered however that specific assets may not exist at the time of your death or may have differing values at the time of your death than at the time of preparation of your Will. In the event that your children are under the age of majority at the time of your death you will want a mechanism whereby their share is used for their care, maintenance, upbringing and education. This is usually accomplished by holding the whole of your estate in a trust fund until your eldest child reaches a certain age and then division of the share commences. 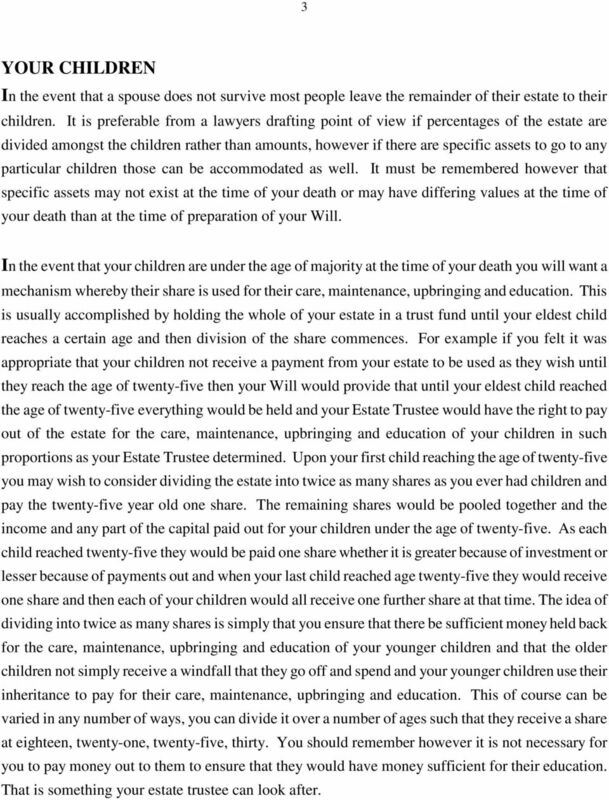 For example if you felt it was appropriate that your children not receive a payment from your estate to be used as they wish until they reach the age of twenty-five then your Will would provide that until your eldest child reached the age of twenty-five everything would be held and your Estate Trustee would have the right to pay out of the estate for the care, maintenance, upbringing and education of your children in such proportions as your Estate Trustee determined. Upon your first child reaching the age of twenty-five you may wish to consider dividing the estate into twice as many shares as you ever had children and pay the twenty-five year old one share. The remaining shares would be pooled together and the income and any part of the capital paid out for your children under the age of twenty-five. As each child reached twenty-five they would be paid one share whether it is greater because of investment or lesser because of payments out and when your last child reached age twenty-five they would receive one share and then each of your children would all receive one further share at that time. The idea of dividing into twice as many shares is simply that you ensure that there be sufficient money held back for the care, maintenance, upbringing and education of your younger children and that the older children not simply receive a windfall that they go off and spend and your younger children use their inheritance to pay for their care, maintenance, upbringing and education. This of course can be varied in any number of ways, you can divide it over a number of ages such that they receive a share at eighteen, twenty-one, twenty-five, thirty. You should remember however it is not necessary for you to pay money out to them to ensure that they would have money sufficient for their education. 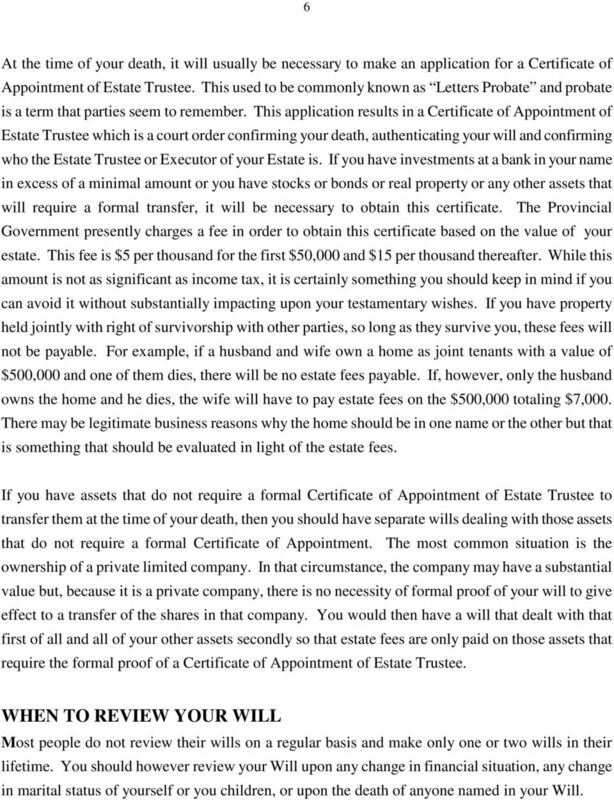 That is something your estate trustee can look after. 5 5 will be responsible for paying monies out to your children, filing Income Tax returns on behalf of your estate and investing money on behalf of your estate. It is not necessary that you simply name one person, it is a responsibility that can be shared and in fact you may wish to have different Executors perform different rolls. Most people have heard the expression Letters Probate. This term has now been replaced in our Courts with the term Certificate of Appointment of Estate Trustee. These terms simply refer to the fact that the Executor or Estate Trustee has made an application to Court for the Court to recognize the fact of your death and issue an Order appointing this person the Executor to administer your estate in accordance with the terms of your Will. Depending on the types of assets that you have in your estate it may or may not be necessary for your Executor to make such a Court application. Whether they have made the application or not they are entitled to act from the moment of your death. Your Executor is entitled to be paid out of your estate for their services. You can in your Will state the amount of the remuneration. If you fail to do so their fees will be determined by the Court and will be based on a reasonable fee taking into account their responsibilities, the difficulty of their job and the size of your estate. 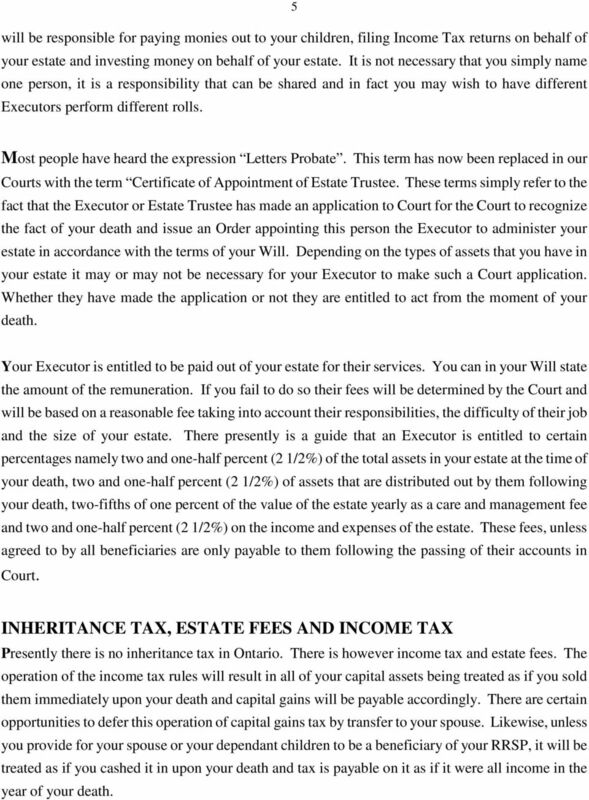 There presently is a guide that an Executor is entitled to certain percentages namely two and one-half percent (2 1/2%) of the total assets in your estate at the time of your death, two and one-half percent (2 1/2%) of assets that are distributed out by them following your death, two-fifths of one percent of the value of the estate yearly as a care and management fee and two and one-half percent (2 1/2%) on the income and expenses of the estate. These fees, unless agreed to by all beneficiaries are only payable to them following the passing of their accounts in Court. INHERITANCE TAX, ESTATE FEES AND INCOME TAX Presently there is no inheritance tax in Ontario. There is however income tax and estate fees. The operation of the income tax rules will result in all of your capital assets being treated as if you sold them immediately upon your death and capital gains will be payable accordingly. There are certain opportunities to defer this operation of capital gains tax by transfer to your spouse. Likewise, unless you provide for your spouse or your dependant children to be a beneficiary of your RRSP, it will be treated as if you cashed it in upon your death and tax is payable on it as if it were all income in the year of your death. 6 6 At the time of your death, it will usually be necessary to make an application for a Certificate of Appointment of Estate Trustee. This used to be commonly known as Letters Probate and probate is a term that parties seem to remember. This application results in a Certificate of Appointment of Estate Trustee which is a court order confirming your death, authenticating your will and confirming who the Estate Trustee or Executor of your Estate is. If you have investments at a bank in your name in excess of a minimal amount or you have stocks or bonds or real property or any other assets that will require a formal transfer, it will be necessary to obtain this certificate. The Provincial Government presently charges a fee in order to obtain this certificate based on the value of your estate. This fee is $5 per thousand for the first $50,000 and $15 per thousand thereafter. While this amount is not as significant as income tax, it is certainly something you should keep in mind if you can avoid it without substantially impacting upon your testamentary wishes. If you have property held jointly with right of survivorship with other parties, so long as they survive you, these fees will not be payable. For example, if a husband and wife own a home as joint tenants with a value of $500,000 and one of them dies, there will be no estate fees payable. If, however, only the husband owns the home and he dies, the wife will have to pay estate fees on the $500,000 totaling $7,000. There may be legitimate business reasons why the home should be in one name or the other but that is something that should be evaluated in light of the estate fees. If you have assets that do not require a formal Certificate of Appointment of Estate Trustee to transfer them at the time of your death, then you should have separate wills dealing with those assets that do not require a formal Certificate of Appointment. The most common situation is the ownership of a private limited company. In that circumstance, the company may have a substantial value but, because it is a private company, there is no necessity of formal proof of your will to give effect to a transfer of the shares in that company. You would then have a will that dealt with that first of all and all of your other assets secondly so that estate fees are only paid on those assets that require the formal proof of a Certificate of Appointment of Estate Trustee. WHEN TO REVIEW YOUR WILL Most people do not review their wills on a regular basis and make only one or two wills in their lifetime. You should however review your Will upon any change in financial situation, any change in marital status of yourself or you children, or upon the death of anyone named in your Will. 7 7 DEPENDANTS You must provide in your Will for payment of reasonable allowances to your dependants. Whoever you are supporting upon your death or whoever may in any way be financially dependant upon you will qualify as a dependant and in the event that they consider that they are not adequately provided for by your Will they may make a Court application for an allowance from your estate. PROBLEM AREAS The family owned business and cottage properties are generally two areas of difficulty and should be the source of discussions with your legal advisor, financial and/or business advisor and your family. Generally speaking the transfer of the family owned business should be the subject of a planned and staged transfer in order to minimize Income Tax consequences. The difficulty with cottage properties is first of all the emotional attachment that families have to them, secondly the difficulty of passing them down through the generations as the number of people in each generation increases and thirdly the Income Tax consequences of any disposition through a Will or by gift. Since your cottage is not a principal residence but is capital property if you gift it while you are alive or transfer it in your Will you will be deemed to have transferred it at its fair market value and you or your estate will be liable to pay Income Tax based on the increase in value from the time of purchase to the time of the transfer. The cost of this may be financed by life insurance however if it is not, the question becomes in your Will, who bears the tax consequences of the transfer of the cottage property without having to sell the cottage? Once you ve tackled the tax issue then the question is just who gets the cottage and on what terms. POWER OF ATTORNEY FOR PERSONAL CARE A Power of Attorney for Personal Care is a document that allows someone else to make personal health care decisions on your behalf in the event that you are unable to do so. Powers of Attorney for Personal Care are also known as living wills. 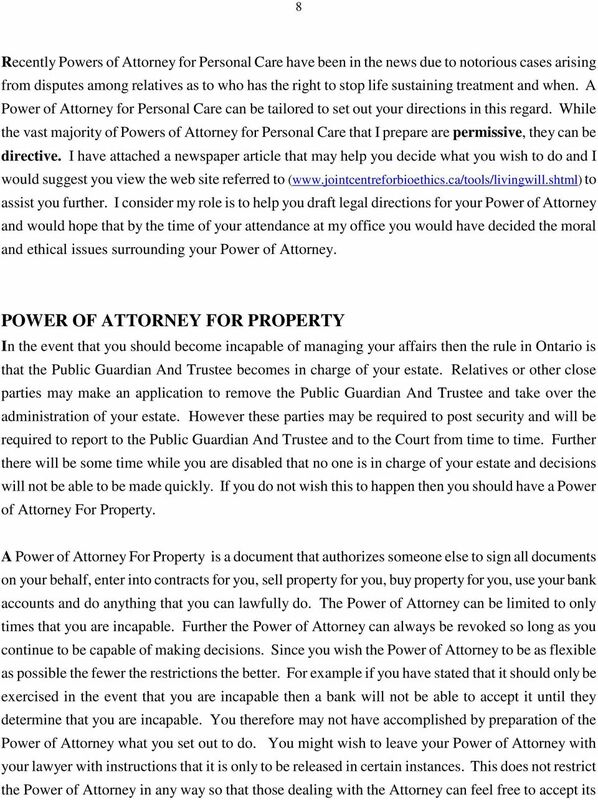 This type of Power of Attorney is only effective in the event that you are clearly unconscious or otherwise temporarily incapable of making decisions on your own behalf or in the event that you are determined by a Court Order or by assessment to be incapable of managing your own affairs. By this document you may give specific instructions as to the type of treatment that you may receive or the type of treatment that you wish refused on your behalf. 1: You Need a Good Estate Plan A good estate plan will help you anticipate the future and manage the present. It is in your best interest and that of your heirs to make certain your intentions are clear. MAKING A WILL. 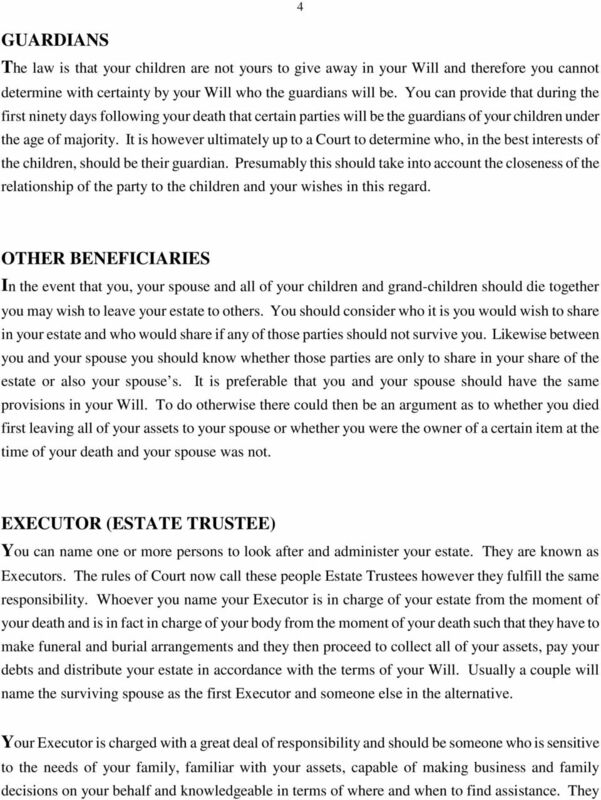 This guide will give you some information about Wills and help you do your own basic, simple Will. Solicitors fees. ltd. by choosing Legal & Contract Services Ltd. years. Covering most Counties throughout the UK. Protection Trusts. 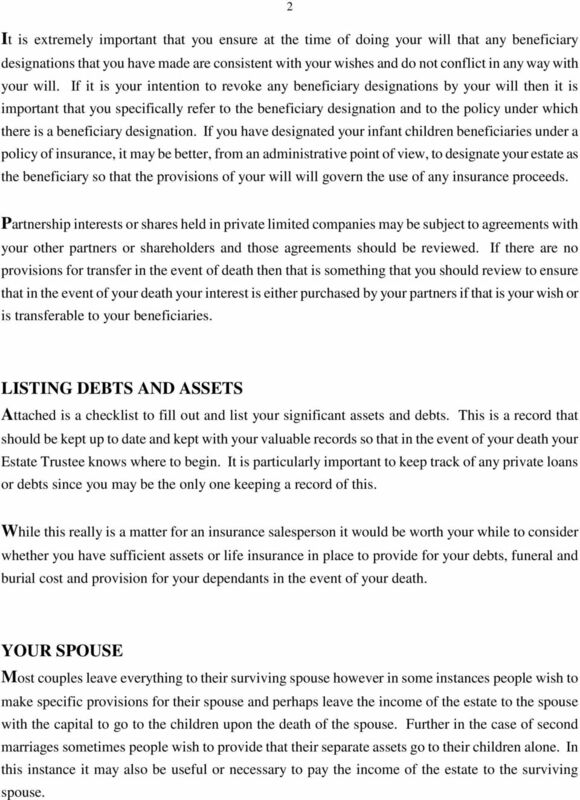 ESTATE PLANNING WORKSHEET The worksheets on the following pages comprise an informationgathering vehicle to assist you in preparing to meet with the attorney who will draft your estate planning documents. ESTATE PLANNING WORKSHEET Single Individuals Information provided is held in complete confidence, and is used for the sole purpose of analyzing estate planning needs and designing estate planning documents. Wills in Minnesota Provided By Cameron Law PLLC (507) 206-4976 When you die, what will happen to your home, your property, your children? 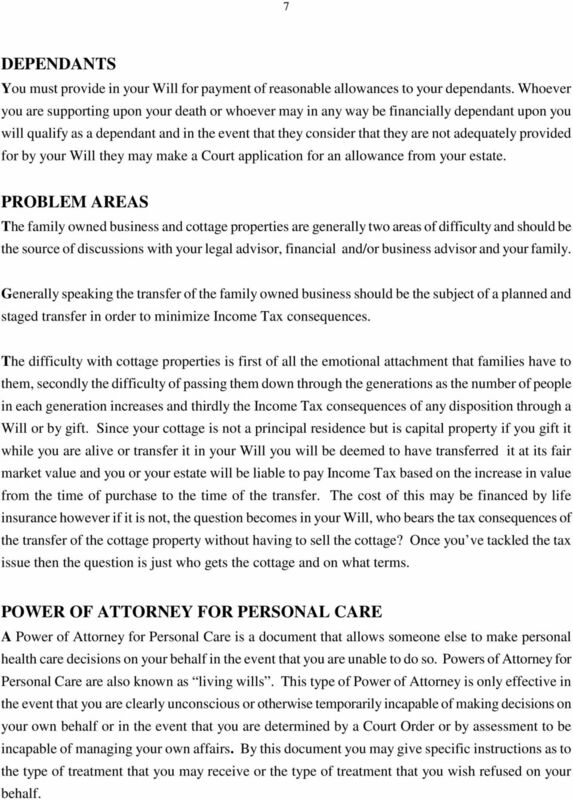 You can answer these questions in a written document called a Will. THE STATE BAR OF CALIFORNIA. Do I Need a Living Trust?